For some organizations, the choice of a website calendar solution involves more than just how well the solution supports the presentation of events online. Because these organizations publish their event information in more than one format, they require a website calendar solution that also supports exporting rich event data in a form they can reuse. For example, a business may want to publish calendars on its website and distribute them in a printed newsletter. Or, a newspaper may want to include a local events calendar on its website and provide audience-specific event listings in its print version. This paper describes how Trumba Connect, a web-hosted solution for publishing customizable, interactive event information online, supports the reverse publishing of online event information. In section 1, we describe how Trumba supports the export of rich event data. In section 2, we present a case study that shows how Ottaway Newspapers, Inc. uses Trumba Connect as the single source of event data for both its online and print publications. Trumba Connect supports reverse publishing by allowing you to generate a customized RSS 2.0 syndication feed for any calendar that you create. The feed contains all of the crucial data about your events and presents the data in such a way that it can easily be extracted for reuse. Contains only the events you specify. Number of days-, weeks-, or months-worth of data to include. Number of weeks previous to the start date to include. Contains xCal data, if you choose. Including this data (by setting a feed parameter) enables you to use XSLT (Extensible Stylesheet Language Transformations) to transform the event data back into the standard iCalendar format. Trumba has created an extension to the RSS 2.0 XML format. 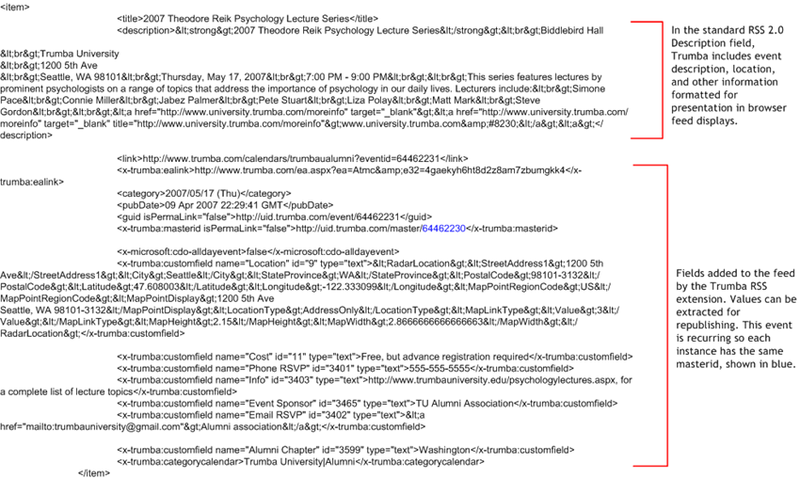 This extension adds a variety of Trumba-specific fields to each RSS feed. These fields identify events as recurring or one-time, provide values for any custom event fields you created in Trumba Connect, and more. Diagram A shows a typical Trumba Connect RSS feed item record. Diagram B provides a visual overview of the event data export process. Case Study: Ottaway Newspapers, Inc.
Ottaway Newspapers, Inc. has Trumba Connect accounts for several of its affiliated newspapers. By storing community event information in the Trumba servers, these newspapers are able to use Trumba Connect to solicit event submissions and publish interactive local event information online. The Ottaway newspapers are also able to export snapshots of data aimed at specific audiences for publication in their print newspapers. What is Ottaway Newspapers, Inc.? Ottaway, the Local Media Group of Dow Jones & Company, operates print and online community media franchises in seven states including daily, Sunday, and weekly newspapers, Internet sites, magazines, and other news and advertising niche publications. Operating results and editorial quality are the specific responsibility of each publisher and team of department heads. At the corporate headquarters in Campbell Hall, NY, executives and specialists in finance, sales, and marketing provide assistance to all locations for print and online operations. A central staff for information services and the Internet provides technical support. For more information, visit www.ottaway.com. What problem was Ottaway trying to solve? Ottaway newspapers provide community event information in their online and print versions. In the past, Ottaway maintained two labor-intensive processes to make the event information available, one for online and another for print. After evaluating Trumba Connect, Bonito realized that it easily satisfied the first requirement. He and other developers could set up the website calendars and then employees at each newspaper could comfortably use the intuitive editing environment to maintain the calendars and keep them up to date. However, Trumba’s original support for reverse publishing wasn’t adequate to meet Ottaway’s needs. For Ottaway, reverse publishing meant exporting its newspapers’ online event information and transforming it into an XML format that contained all of the event and formatting information required by Jazbox, the MediaSpan Media Software content management solution Ottaway uses to print their newspapers. To meet Ottaway’s reverse publishing requirements, a Trumba developer agreed to create an extension for the generic RSS 2.0 library. This extension adds Trumba-specific fields to the feed that provide support for recurring events and custom event fields. The developer also wrote an Ottaway extension that loops through the Trumba feed and pulls out custom field values and other information required to appropriately display the events. Bonito incorporated the Ottaway RSS extension into an application that he wrote. Using a friendly front-end interface, newspaper editors specify a range of events they want to print (for example, events from the Pocono Record Outdoors/Recreation calendar for the week of May 11, 2007) and generate a Trumba RSS feed. Bonito’s application extracts data from the feed to populate fields in a new XML file. The XML file is then transformed by XSLT so it can be read by Jazbox. Jazbox generates output that is in turn read by Adobe® InCopy®, which produces specific print layouts for different newspapers. Diagram C provides a visual overview of the Trumba – Ottaway reverse publishing process. 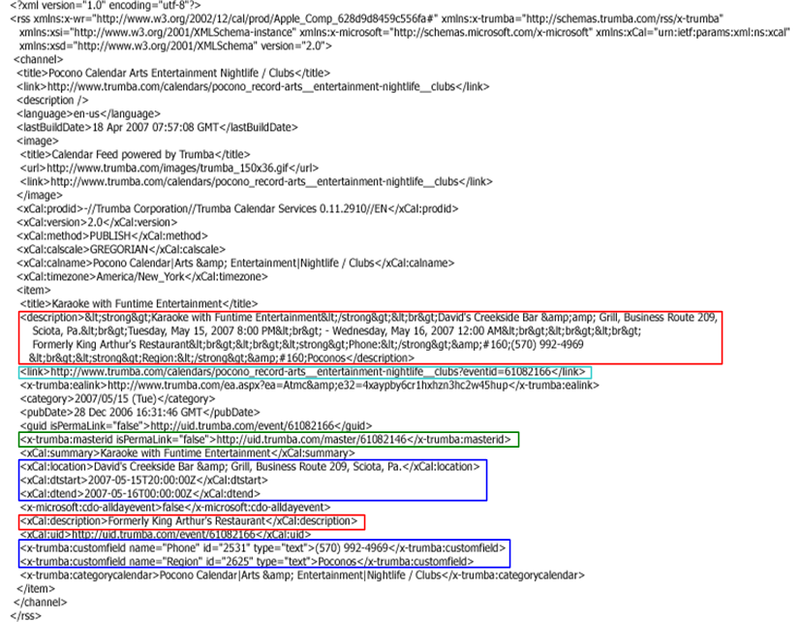 Diagram D, shows an event from the Pocono Arts, Entertainment, Nightlife, and Clubs calendar as it appears in a Trumba RSS feed and in an XML file ready to be read by Jazbox. 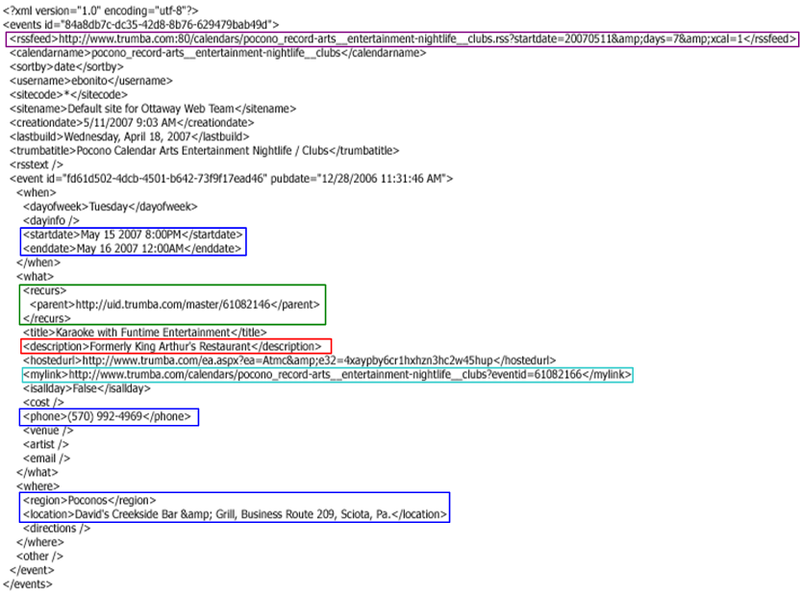 As explained in the Color Key, colored areas in the two files highlight selected fields from the RSS feed that have been used to populate the XML file. Colored areas in the following two code samples highlight selected fields from the Trumba RSS feed that map to fields in the Jazbox-ready XML file. The RSS feed contains two description fields. The longer RSS description field contains HTML formatting tags to ensure that the event displays well in browser feed readers. The description field in the XML file is populated by the much simpler xCal description. The RSS link field contains the URL that opens a details page for the event. The same URL appears in the <mylink> tag in the XML file. The masterid field in the RSS feed (added by the Trumba RSS extension) indicates that this event is recurring. This masterid populates the <recurs> field in the XML file. The event start date, end date, and location in the XML file come from the xCal fields in the RSS feed. The phone and region come from custom fields added to the feed by the Trumba RSS extension. The URL with parameters that generated the RSS feed. This URL indicates that an editor at the Pocono Record newspaper requested a print version of the following range of events: Seven days’ worth of events from the Arts, Entertainment, Nightlife, Clubs calendar starting from May 11, 2007. The “xcal=1” parameter ensures that the feed will contain the xCal data essential to the Ottaway reverse publishing process. © 2004-2019 Trumba Corporation. All rights reserved. Trumba is a registered trademark of the Trumba Corporation in the United States and/or other countries. All other trademarks, trade names, or company names referenced herein are used for identification only and are the property of their respective owners.